An uncontrollable coughing and heavy wheezing fit may seem all too familiar to those with severe asthma. Childhood asthma impacts millions of children and their families, and the majority of children who develop asthma do so before the age of five (aaaai.org). The US Department of Health and Human Services defines asthma as an inflammatory disease of the airways with generally reversible airflow obstruction and increased sensitivity of the throat muscles (Earl). Asthma symptoms include: breathing problems, intense coughing or wheezing, and chronic respiratory infections (Earl). Lung tissue inflammation, due to environmental, immunological, or genetic factors, can be the cause of serious asthma (aaaai.org). However, recent studies have identified another serious cause of asthma: “the bacteria living in the nasal passages, throat, and lungs.” Bacteria living in a certain area of the body is referred to as a microbiota, and its composition at each location on body is distinct (Versalovic). For example, the bacteria that live in the throat and lungs, comprising the respiratory microbiota, cannot thrive nor live in the kidneys or skin. Harmful bacteria may get trapped in the respiratory microbiota and cause an inflammatory response of the cell tissues and muscles in the throat and lungs (Versalovic). A better understanding of the disease has been reached due to new medical insights that have linked respiratory microbiota during infancy to the development of severe childhood asthma and chronic breathing problems later on in life (Teo). The formation of a microbiota occurs during an infant’s first year of life, similar to how an immune system develops. The immediate surroundings have a large impact on the baby because both the good and bad bacteria will essentially colonize inside and outside the body. It is common for many infants to get sick or develop respiratory infections, often from harmful microbes, or tiny bacteria, that get trapped in the part of the throat that connects to the nose (Teo). Infections during infancy that spread from the throat to lower respiratory airways and lungs can lead to development of asthma later on in life (Teo). Problems such as bacterial respiratory tract infections during infancy have a strong association with worsening or increased severity of symptoms in children with asthma (Earl). Now scientists are realizing asthma can be caused by the bacteria living in your throat. The Childhood Asthma Study (CAS), an investigation of the respiratory microbiome during the first year of life for a cohort of 234 children, correlated bacteria and asthma development. The trial came to this conclusion by tracking infants with both respiratory infections and breathing problems and looking at their throat bacteria collected from a cotton swab (Teo). Results showed different types of bacteria living in a healthy throat versus a sick asthma throat (ibid). The majority of all the affected children contained a harmful throat bacteria called Streptococcus (ibid). In addition, the majority of all the healthy children contained a beneficial throat bacteria called Moraxella, which was significantly absent in the sick throats (ibid). Based on this trial, Moraxella may play a protective role in the throat, and if absent, can lead to negative impacts and colonization of harmful bacteria like Streptococcus (ibid). The harmful Strep bacteria indicates a strong asthma predictor because those infants developed mild to severe breathing problems within the next 6 months (ibid). Thus, the types of bacteria living in the respiratory microbiota can contribute to the nature of infections and inflammatory responses seen in asthma (Earl). 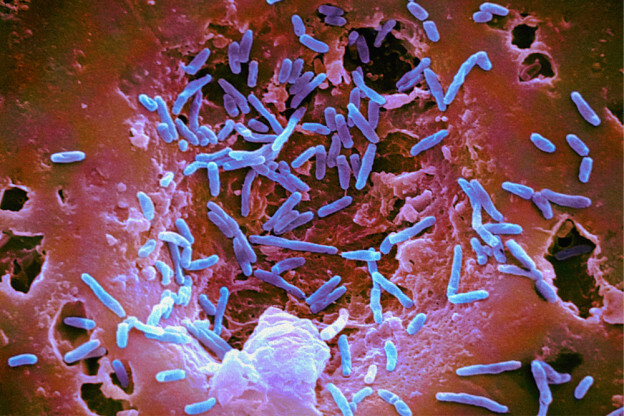 The Human Microbiome Project (HMP), initiated in 2008, caused a surge in research about how the tiny organisms living on and inside humans can affect the body in health and disease, such as throat bacteria and its impact on asthma. Funding of this project advanced technology in order to detect and code bacterial DNA, known as genetic sequencing. In a recent pediatric asthma study, the effects of the respiratory microbiota on asthma was determined by genetically sequencing bacteria in both healthy and sick airways, and then comparing the DNA (Versalovic). Broad results showed the bacteria in asthma airways differed from bacteria in healthy airways (ibid). However, upon further investigation of the bacteria by comparing their DNA through genetic sequencing, it was determined that the harmful and beneficial bacteria were very closely related (ibid). This result signifies that such minute differences in DNA can have such a large impact on how the bacteria contributes to the respiratory microbiota, whether it be positive or negative. The results of this study indicate future research on possible asthma treatments is needed to determine how to carefully isolate harmful bacteria from the throat, without disturbing the closely related beneficial bacteria (ibid). Asthma was previously understood as a disease due to genetic or environmental factors, however now scientists realize that it is caused by the bacteria living in your throat. The new research and biology behind the development of the disease will allow scientists to properly understand childhood asthma. The unique approach of changing or isolating the bacteria living in the respiratory microbiota as a treatment plan may impact numerous children and their families dealing with the asthma disease. Earl Chris, An Shi-qi, Ryan Robert. “The Changing Face of Asthma and its Relation with Microbes.” Science Direct. 2015 July;23(7):408-418. Web. 5 Oct. 2015. Huang YJ. “The Microbiome in Asthma.” The Journal of Allergy and Clinical Immunology. 2014 Nov 4;135(1):25-30. Web. 4 Oct. 2105. Teo Mei Shu, Mok Danny, Pham Kym. “The Infant Nasopharyngeal Microbiome Impacts Severity of Lower Respiratory Infection and Risk of Asthma Development.” Cell Host Microbe. 2015 May 13;17(5):704-15. Web. 5 Oct. 2015. Versalovic J. “The Human Microbiome Project and Probiotics: Implications for Pediatrics.” Karger. 2013 Nov;62(2):42-52. Web. 5 Oct. 2015.